A combination of dreams, narratives and characters blend to create dystopian landscapes in Shrimanti’s paintings. Inspired by the writings of Wendy Roniger and Roberto Callaso, Shrimanti’s current body of work treads the fine line between myth and reality told through historical texts. 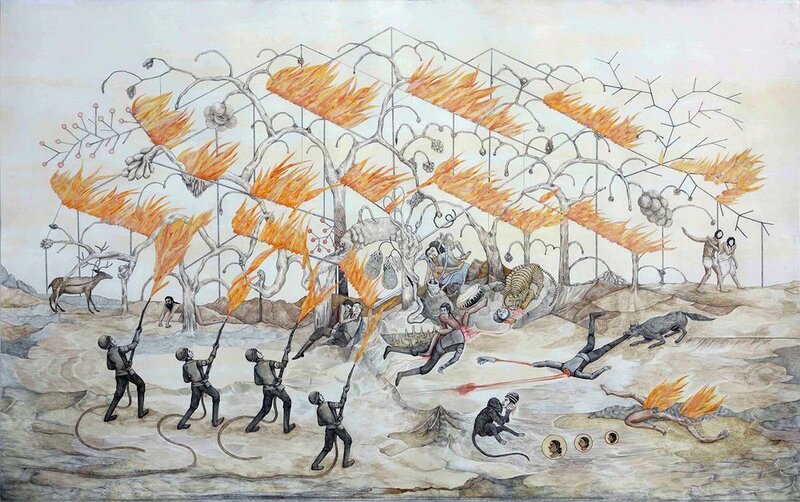 The series focuses on ‘Fire/Agni’ in multiple contexts – drawn from Francois Truffaut’s science fiction movie, Fahrenheit 451, Miniatures, Company school paintings, Colonial history, mythology, encyclopedia illustrations. Together, the sources lend a fiction, a story that doesn’t exist but stems from her imagination. Shrimanti Saha visits mythological tales, and tries to bridge the gap between their oral nature and the visual depiction of them. She takes inspiration from science fiction, philosophy and evolutionary biology, and renders her large scale drawings with these smaller narratives informing and creating a bigger picture. Shrimanti Saha completed her BVA (Painting) Faculty of Fine Arts, 2009 and MVA (Painting) from Faculty of Fine Arts, MS University, Baroda 2011. She received the Inlaks Fine Arts Award in 2015 and was a runner up for Glenfiddich Emerging Artist Award in 2014. She received the Krishnakriti Scholarship, Hyderabad, in 2008 -11 and has participated in residencies such as the Taj Residency and Ske Project, Bangalore, 2015 and Kalakriti Artist-in-Residence, Hyderabad, 2015. She has been part of group shows at Nature Morte, Gurgaon; Gallerie 88, Kolkata; Barter Collection, Mumbai Art Room, Mumbai; Baroda Redux, Art Konsult, New Delhi; Alliance Francaise de Delhi; Art city project at StudioX, Mumbai; Residency Show, Kalakriti Gallery, Hyderabad; Back to College, Faculty of Fine Arts, MS University, Baroda; Knots, Baroda; Ashwita gallery, Chennai. She has worked as a freelance illustrator and storyboard artist for advertisement agencies and has also interned in wooden toy making from Channapatna, Karnataka. Saha lives and works in Baroda.